In 2017 we were commissioned by Essex Music Education Hub to consult with young people across the county, particularly those less engaged with music opportunities and Hub provision. The main purpose of the consultation was to get to the heart of what young people are experiencing, what they want and, in doing so, ensure music opportunities are relevant to the needs and interests of young people in Essex. The consultation involved six focus groups which took place at Essex Children in Care, Northwick Park Primary School, Princes Trust Essex, Seevic Community College, Saffron Walden High School and Lexden Springs School. 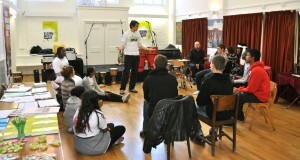 Online and paper surveys were shared with schools and youth organisations across Essex and an interactive survey was developed in response to the different environment of the Sounds of Essex youth music festival and sessions with a ‘drop-in’ nature at Tendring Music School. We had a huge response from 957 children and young people aged 7 – 25 years old from across Essex. Click the links below to read the executive summary and infographic report.